We guarantee the authenticity and quality of our products. You get a 12-month WatchPool Warranty. We certify the proper functioning and condition of this watch as described. We cover the costs of shipping or returning the watch. We ship insured and worldwide. If you are not happy with your purchase, you can return your watch to us in its original condition within 14 days of receipt without giving any reasons. The safety of our customers is paramount for us. Your personal data such as address, login and payment information is encrypted via SSL (Secure Socket Layer) during any transaction on the website. Thus, it can not be read by third parties. If you look at this watch you have the feeling it smiles at you. 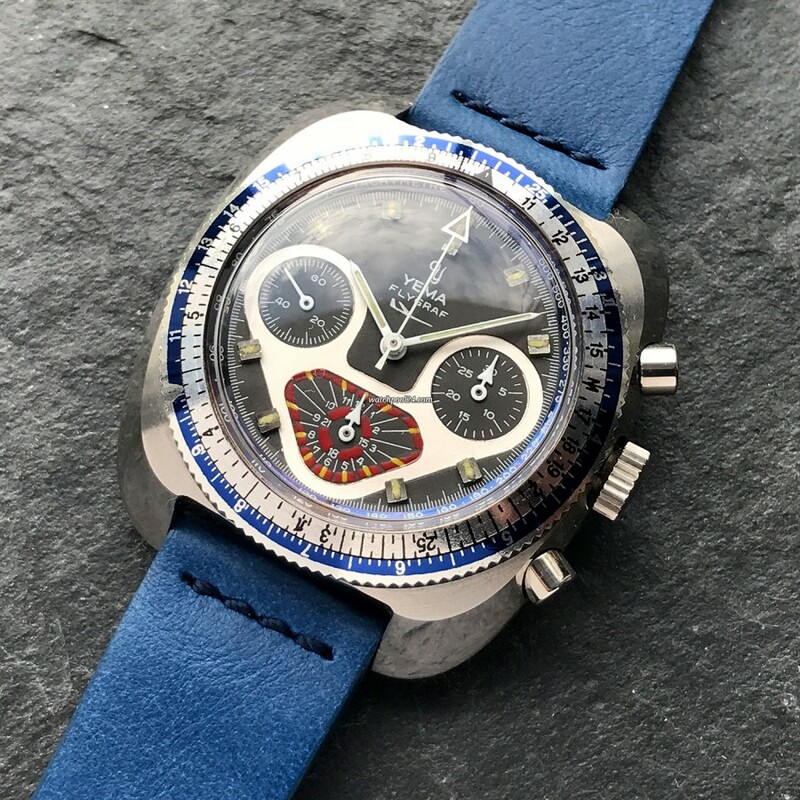 The Yema Flygraf is definitely something special and unusual among vintage watches. Yema is a French brand founded in 1948. The watch manufactory produced a range of strikingly designed chronographs and tool watches, making them so popular with watch collectors today. Here we offer you the Yema Flygraf from the 70s. As the name suggests, this is a tool watch for airplane pilots. The timepiece owes its unique charisma to the sophisticated design from the case to the dial. The famous Yema case has a very attractive and unusual shape. The case has sharp edges and looks authentic. On the case back is the beautiful Yema logo encircled by engravings, all clearly visible. The dial is in excellent condition with no quirks. The luminous material is intact in all hour markers and hands. The chronograph hands all have a triangular tip. This Yema Flygraf has a blue-silver rule bezel. The bezel is rotating smoothly to both sides. A good explanation of how to use such a bezel is provided by aBlogtoWatch in this article . The watch is powered by the Valjoux 7736 movement. All functions have been checked and work flawlessly. This Yema Flygraf has a striking design and has been preserved in desired condition. The watch is very comfortable to wear. All in one a great daily watch and a super addition to any vintage watch collection. All watches are located in our office in Munich, Germany. You are very welcome to visit us.